We got an “emergency” call from our friends living on the Hopi Indian Reservation that the last Katsina dance of the season was taking place in a couple of days. So with hardly any notice we packed up and headed out. 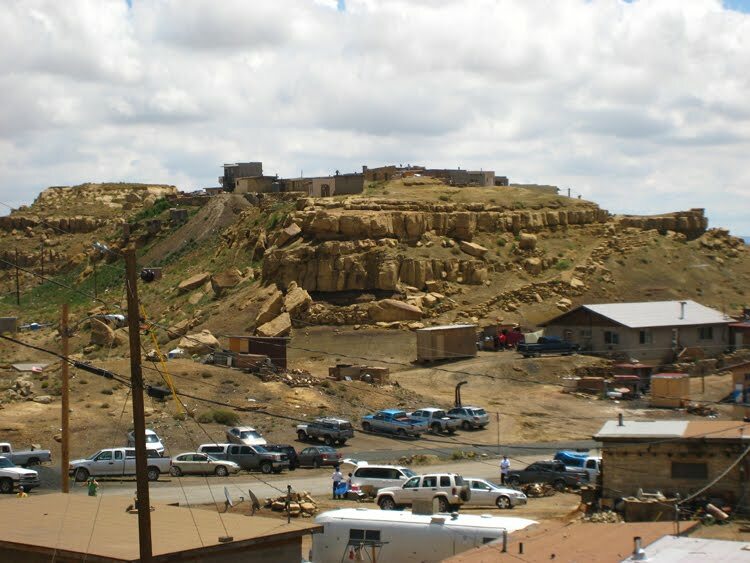 The Hopi Reservation covers about 2,400 square miles in Northern Arizona, an approximate 5 ½ hour drive from Santa Fe. 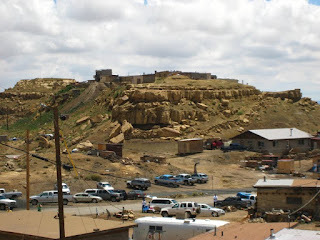 About 7,000 full time inhabitants live in 12 villages which stand on top and at the foot of 3 mesas . One goes up and down a lot of steep hills as one drives and walks around. Coming from New Mexico the quickest route is through Gallup (a true frontier town) into Navajo country. Though their ancestral lands originally covered far more territory, today Hopi is surrounded by the Navajo Nation which has caused conflict for generations. While the Navajo were a nomadic tribe, the Hopi have lived in their current location for over 1000 years. They have the distinction of being the only Native American tribe not to have been relocated because their land has never been of interest to the white man for farming or mineral development. The road up to Second Mesa was only built in the 1960’s, Life at Hopi remains extremely simple. Many go without indoor plumbing and have to haul their own water. 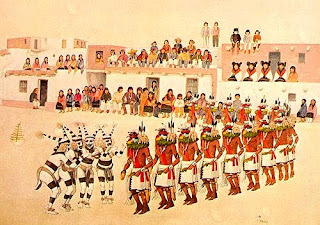 The Hopi calendar is marked by dances that can be religious or social. What we attended was an important religious event, Niman, the Home Dance. It takes place every year near the end of July and is the last appearance of the Katsinam in the villages before they return to their home in the San Francisco Peaks in Northern Arizona. 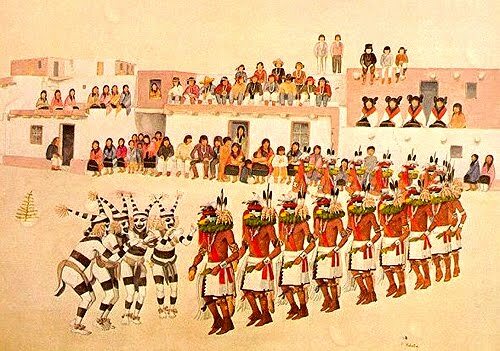 The dance goes on from sunrise to sunset with short breaks in between when the Katsinam return to the Kivas (underground religious chambers) and refresh. As visitors we do not sit on the plaza (the square) where the dances take place. First priority goes to the families that retain their ancestral houses on the plaza and their extended families. Most visitors sit and stand on the roof tops surrounding the plaza. No photography is allowed. It is an arid land and in 20 years of visits we have never experienced rain. But this time bright sunshine alternated with torrential downpours. Many at the dances got soaked but we managed to dodge the rain drops and were inside when the rains came. The Katsinas we were watching are called Susuk’holi on Second Mesa. They are the messengers to the Rain gods! Our friends Joseph and Janice Day have a trading post on Second Mesa and their clients are not just the tourists who come from all over the world. The Indians come as well to trade for the many supplies that they need for the dances. For instance outside their small shop is a pile of wood, not logs for firewood but rather cottonwood roots from which the carvers create the Katsina dolls. These are given to the children as rewards for good deeds and also to teach them about the Katsinam. Every village has variants of the Katsinam and they can be very difficult to identify, but a Hopi learns early on. The Hopi and their Katsinam have fascinated Anglo artists and intellectuals from Jung and the Surrealists to the German artist, Horst Antes, who has the most important collection of Katsina dolls today. A bibliography attempting to cover all that has been written about the Hopi was published in the 1970’s. It is a tome of over 700 pages and it could probably be expanded several fold by now. I, myself, could go on for pages and pages. I plan to return to the land of the Hopi in future missives.